Growth Habit: This prostate and scrambling plant has solid, hairless, grey/ green stems that can reach 1m in length. A single plant can cover one square metre. Foliage is soft and carrot-like. 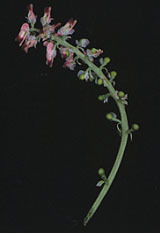 Type of Plant: Fumitory is a climbing annual herb. Flowers: Flowers occur in clusters of 10 to 15. They are tubular, pink with a blackish tip. Fruit/Seed: Small, smooth fruits are produced on a short stalk. The fruits contain several tiny seeds. Dispersal: Reproduces from seed with germination in autumn and spring. Distribution: Fumitory most commonly occurs in crops, run down pastures, roadsides, home gardens and waste places. It may compete strongly with crops, particularly cereals, vegetable and legume crops. Grubbing (autumn, winter and spring). Small areas eg. Home garden. Ensure the taproot is removed. Grazing (autumn, winter and spring). Block grazing with sheep is useful in controlling weeds such as fumitory. Avoid overgrazing. Herbicide (autumn, winter and spring). Herbicides registered in Tasmania include metsulfuron, glyphosate, dicamba, MCPA and mecoprop.